Discussions between the FMPA and Premier League have led to the funding of an education workshop for medicine and performance staff in professional football. 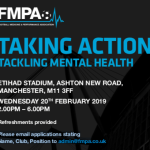 This will be held at the Etihad Stadium and will be FREE to all FMPA members. A nominal charge of £30 will be applicable for non-members. The event is expected to stimulate a lively debate about where we are with this increasingly important issue and explore the role of, and the thoughts of our members in determining what needs to be done to deliver best practice care within football. Please note delegate spaces will be limited and allocated on a first come basis.